The Swede was at his clinical best, as Jose Mourinho’s side secured a comfortable victory. PAUL POGBA PRODUCED an assured display as he made his second Manchester United debut in Friday’s 2-0 home win over Southampton following his world-record transfer from Juventus, though all the talk afterwards was about Zlatan Ibrahimovic’s double. The France international, 23, earned the approval of the Old Trafford crowd with some elegant touches and came close to scoring on several occasions as he completed the full 90 minutes. The rangy midfielder with the peroxide blond hair returned to United last week in a world-record 89 million pounds (105 million euros) transfer from Juventus. Pogba, who had not played since France’s 1-0 loss to Portugal in the Euro 2016 final on July 10, played alongside Marouane Fellaini at the base of midfield in a 4-2-3-1 system. He had only trained with his new team-mates for around 10 days and manager Jose Mourinho said before the game that he was not capable of producing a “super performance”. Mourinho had warned supporters not to expect Pogba to “dribble five players and score a wonder goal” with his first touch. The Frenchman’s first involvement indeed proved forgettable, an embarrassing air-kick gifting possession to Southampton’s Pierre-Emile Hojbjerg, but he quickly caught up with the pace of the game. Pogba registered United’s first shot on target, which was comfortably saved by Fraser Forster, and his inventive pass to Juan Mata culminated in Ibrahimovic volleying wide. After Ibrahimovic’s brace had put United 2-0 up, Pogba went close three times, heading over the bar from Mata’s 64th-minute corner and flashing a couple of shots wide. He also proved an alert presence in defensive positions and drew roars of approval from the home fans midway through the second half by skilfully spinning away from two opponents in midfield. Pogba left United in 2012 after failing to break into the first team under former manager Alex Ferguson, only to return last week after the most long-running transfer saga of the close season. Four years, five months and one day had passed since his previous appearance for the club, as a second-half substitute in a 5-0 Premier League win at Wolverhampton Wanderers in March 2012. A picture of Pogba in a red United shirt adorned the front of the match-day programme for the Southampton game. Vendors outside the stadium were selling Pogba scarves, while several fans sported United shirts with ‘POGBA 6′ on the back. As well as Pogba’s second debut, Friday’s game also represented a first competitive United home outing for Mourinho and new signings Ibrahimovic, Eric Bailly and Henrikh Mkhitaryan, a second-half substitute. Ibrahimovic put United ahead in the 36th minute with an imperious header from Wayne Rooney’s right-wing cross and added a second goal with a penalty early in the second half. 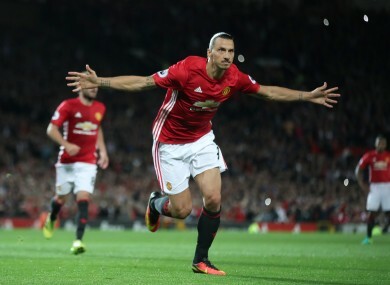 Email “Zlatan-inspired Man United earn convincing win over Southampton”. Feedback on “Zlatan-inspired Man United earn convincing win over Southampton”.